Finally getting around to writing down how we spent the rest of our vacation before Christmas. 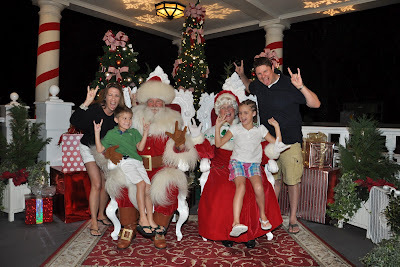 In case you didn't know, a cruise was a big part of that trip and you can read everything about that here - http://www.the-wynns.com/2011/12/disney-cruise-review.html. This will be another long post with a bunch of photos, hope that you have a few minutes. After we finished the cruise, we were able to go to Disney to stay for about another week to have some fun together and see some friends. My parents and Aunt Laurie were even to make it down for some time with us too. One thing we learned this year is that we tried to do too much. Normally we like our vacations nice and relaxed. No agendas, sleep in and eat breakfast before even thinking about what we are going to do. But we wanted to do so much, a lot of things for the first time that we were just way too busy, next time we will structure it a little bit differently. About those firsts, as the kids get bigger there are a lot of rides that they are able to try for the first time. Ella got brave and tried Expedition Everest. After being pretty nervous and having some trepidation, she ended up loving it and we rode it twice in a row. 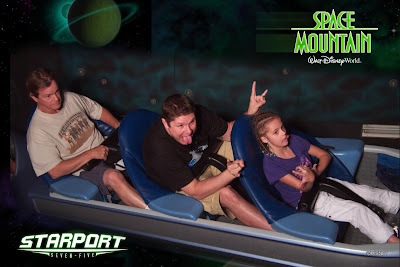 Ella also rode Aerosmith's Rock n' Rollercoaster (family favorite). Watching the train launch at the beginning freaked her out, but just like Everest, she loved it. 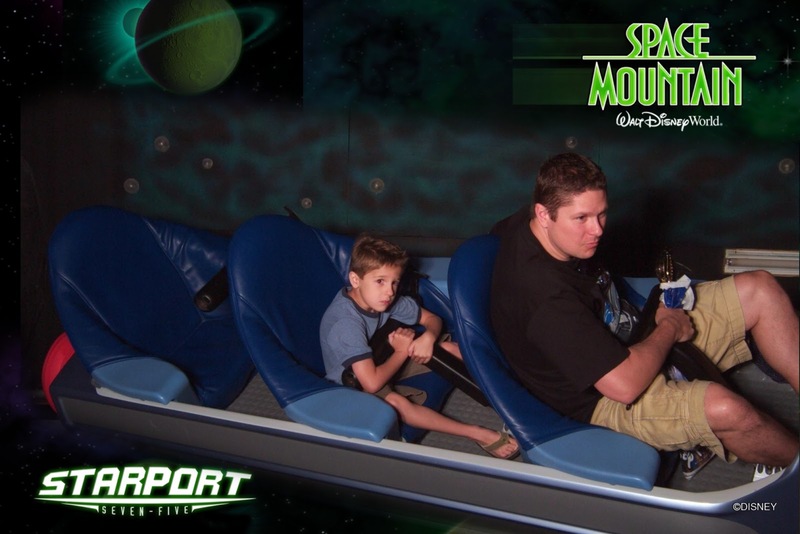 Max rode Space Mountain, always a good first ride. Afterwards, he said that he was never going to ride it again, but by the time we got home he changed his tune. Max also got in his first ride on Big Thunder Mountain Railroad. Just like Ella, he was reluctant, but then loved it. While not his first time, Max wanted to go on Tower of Terror, which is one that Ella is scared of after riding it last year. Now the big excuse for us to take a vacation is that we have gone each year on Max's birthday. It really is the only thing that he really wants to do (though now that is changing into going on another cruise). In keeping with tradition, we rode his favorite ride, Pirates of the Caribbean, 6 times in a row. Once for each year. As always, we spent a lot of time at all of the parks. The biggest bummer was when we went to Epcot on our last night. We were going to get our last ride of the whole trip in on Test Track. It was getting kind of late, and we had not had dinner yet, so Sarah went ahead to get us a table before the place closed down while the kids and I went on the ride. We finally got on, were half way through the ride and were about to burst through the doors to the outside speed part when the ride just completely shut down. The car stopped, everything went black, it was a total system failure. I knew it was not good when I realized that all of the safety mechanisms had been released and I was able to unclick my seatbelt. After awhile, a worked came by and took us out of the car to walk out of the ride. It was kind of cool in that we were able to walk back through almost the entire ride stopping at each car along the way to get the passengers out. The workers pointed out lots of behind the scenes things on how it worked, pointed out hidden mickeys to the kids, so it was kind of cool to see that, but a real bummer that our last ride literally failed at the moment before the best part. On another note, Sarah grabbed a table at the pizza place in Italy, and it was some of the best pizza we have ever had, can't believe that we never ate there before. We even took a day out to head over to Universal mainly for Harry Potter, but they have some other good thrill rides as well. I had the longest wait ever for ice cream. No exaggeration, there was only like 3 people in line before me and I swear it took 30 minutes to get to me. It took so long that Grandpa Jim and the kids played some water gun games and won giant stuffed animals all while I was in line. As always, heading to Florida means that we get to spend some time with friends from our time living there. We would have liked to have spent a little more time, next time we are going to plan things out a little differently. Somehow, we have almost no pictures from those visits. It is always good to see friends and spend some time catching up. Oh, and unlike last year, we had great weather. No freezing temps and having to buy coats, hats, gloves, and scarves just to try and stay warm.